This entry was posted on May 11, 2010 at 10:15 am and is filed under Barack Obama, Conservative Issues, defense, Economy, founding fathers, Iran, Israel, Politics, religion. You can follow any responses to this entry through the RSS 2.0 feed. You can skip to the end and leave a response. Pinging is currently not allowed. You’d better check your sources more carefully. All you’ve done is repeat some “backyard gossip”. Neither the Federal government, nor even the State government, was to blame for this one. The blame belongs to a private contractor who misunderstood the law in this are (that happens a lot), and then tried to blame its error on a State (not Federal) policy that may not actually exist. 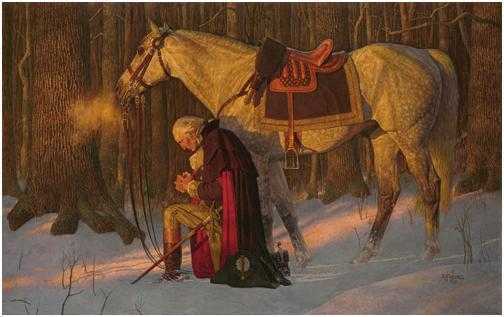 Oh, and by the way, the bit about “Washington’s prayer at Valley Forge” has been pretty much exploded as a fable. The source is one “Parson Weems” who actually wasn’t a parson, and who made up numerous stories about Washington (yes, alas, including the one about the cherry tree). Don’t get me wrong, Washington was a religious man, but he certainly was no fundamentalist either. In fact, he never publicly took communion. This article lays out the issues rather straightforwardly. PrayerChances are the folks frequenting the Ed Young Senior Citizens Center in Port Wentworth, Georgia never imagined they would see the day when they would be told they were violating the Constitution by saying grace before meals. But that’s what happened last Thursday. Because the meals are provided with federal money, praying over the food is considered a violation of what is commonly referred to as the separation of church and state. So the prayer that was usually said before meals at the center was dropped in favor of a moment of silence. Senior Citizens, Inc. provides the meals for the center under a contract with the city of Port Wentworth, near Savannah. The meals cost about $6 a plate, but the seniors pay only 55 cents, with the federal government picking up the tab for the rest. The company’s vice president, Tim Rutherford, told the Associated Press that members of his staff visited the center recently and noticed people praying just before lunch was served. The “moment of silence” was introduced to avoid a potential conflict with federal authorities. “We can’t scoff at their rules,” Rutherford said. “It’s part of the operational guidelines.” The policy has stirred up a bit of a ruckus in the city and Rutherford feels his company is being unfairly blamed. “It’s interpreted that we’re telling people that they can’t pray, but we aren’t saying that,” he said. “We’re asking them to pray to themselves. Have that moment of silence.” But Mayor Glenn “Pig” Jones is anything but silent over his anger at having senior citizens of his city told they may not pray aloud at the center. “It was one of the hardest things I ever did as mayor is to look those people in the eyes and ask them to be patient with me and honor their God in a moment of silence until I can have a resolution to this,” said Jones, who has the city attorney looking into the matter. “For me to look at their eyes and tell them they can’t thank God for their food, it’s unheard of – I can’t take it.” Jones said he considered ending the city’s contract with Senior Citizens, Inc. Ever since the U.S. Supreme Court rulings on prayer in public schools in the 1960’s and subsequent rulings on prayer at school graduations and athletic events, public officials have been entangled in an endless series of controversies over what does or does not constitute a violation of the “separation of church and state.” Christmas concerts in most public and any number of private schools have been supplanted by “holiday” or “winter” concerts, with songs memorializing “Frosty the Snowman,” a “Sleigh Ride” and a “Winter Wonderland,” with no constitutionally troublesome mention of Wise Men, a King named Herod or the rumor of a child to be born in Bethlehem who would be Christ the King. The YMCA is a thoroughly secular organization open to people of all faiths or no faith. But back in the mid-1960’s, the YMCA in Savanna, Georgia was informed by the U.S. Department of Housing and Urban Development it would have to drop the word “Christian” from the Young Men’s Christian Association to receive a federal grant for a building project that had been approved. The “Y’ dropped the grant instead. At a Catholic college in my city, no crucifix may be hung in the classrooms of a certain building on campus, because federal funds were used for its construction. Clearly the federal government IS prohibiting the free exercise of religion. But defying the Constitution is nothing knew to Obama or to liberalism. Most of the original states continued to practice “state religion” well AFTER the Constitution was ratified. For example, New York was officially Anglican until 1846. North Carolina was officially Anglican until 1875. As in state religion. As in “no separation between church and state.” The liberals who try to create a “separation of church and state” are clearly completely wrong in their understanding. I’m not going to get into a silly contest over arguing over Washington as a “fundamentalist.” But he – and almost all the other founding fathers – were profoundly religious men. I can’t say for certain whether Washington publicly took communion. I choose to believe the above sources that he did. But your contention that Washington didn’t (which is clearly possibly if not probably wrong), and that therefore he never prayed is very obviously logically fallacious reasoning by non-sequitur. The Quakers don’t practice baptism. Therefore they are not fundamentalists and do not pray. Let’s just put it this way. You contend that George Washington – whom you acknowledge yourself to be a religious man – did not pray prior to what he very likely knew to be an all-or-nothing proposition. (If your contention is that he didn’t pray in the precise posture and place depicted in the painting, I would ask you to quit fixating on the most trivial of trivialities and get a life). How many religious Christian men do you know would refuse to pray prior to the biggest and most critical struggle of their entire lives? When the lives of thousands under them – and the fate of the very nation – was at stake??? Again. Give me a break. On separation of Church and state…..the only true & right meaning of this is that “the state has NO RIGHT to tell the Church what they can & can not do! It is fittingly appropriate to say, “God bless you for saying that,” Becky. The Soviet Union had a “separation of church and state,” but America certainly didn’t. The phrase appeared only in a private letter written by Thomas Jefferson, which had to be completely stripped of its context in order to create the meaning that liberals had embraced (in the Supreme Court case, ONLY the words “a wall of separation between church and state” was allowed into the record). Furthermore, Thomas Jefferson was not involved in the writing of the Constitution; he was in France throughout that period. So why did one phrase – stripped from its intended context – from one private letter by one guy who wasn’t even present at the Constitutional Convention, determine our policy? Because liberals are vile people who despise the truth and despise our nation’s history, that’s why. A few founders believed that the federal government should not be allowed to endorse any particular denomination, but that the states could do so – and if you didn’t like it, move to another state. We still had “official state religions” at the time of the ratification of the Constitution, and for decades afterward. For example, New Hampshire was a protestant state, and officials had to be protestants. And every single state acknowledges God in their Constitutions.